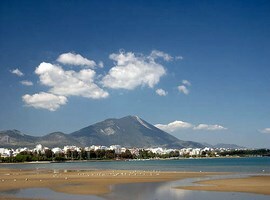 Evia is the second biggest island in Greece and is separated in three parts; the southern, the central and the northern. In this article we will learn more information about the last. 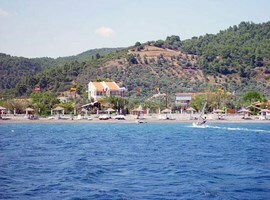 Evia was and will always be an attractive and a low cost holiday destination, ideal both for young people and families! The North part of Evia jumps out the other tourist destinations in Greece as offering the perfect combination of the rich green mountainous forests with the excellent in beauty beaches. The entire area of North Evia has a significant history and an inheritance from many different cultures during the centuries. It has also many locations either connected with mythology or with some of the most important moments in the history of Greece. Chalkida is the capital of the island of Evia, a crossroad of people and cultures because of its geographic position and the apple of discord for the powerful of each era. The beautiful atmosphere of the modern city, known for its peculiar tidal phenomenon of Evripos Strait completes the seaside pedestrian road, the castle, the majestic temples, the squares and neoclassical mansions. the numerous shops, restaurants, ouzo and meze restaurants, café bars and the intense nightlife of the city give a special colour . 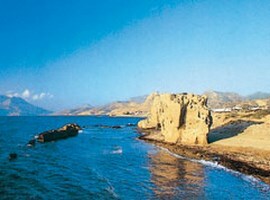 It’s a picturesque place of the city, the narrowest point of the Strait of Evripos. This bridge attracts thousands of people to watch the famous tidal phenomenon of Chalkida. The road was used during the Hellenistic and Roman times, it was separating the industrial area of ancient Chalkida connecting the northern port of Liani Ammos, with the southern part of the city. It is built on the hill of the Boeotian coasts, strategically located as checks the Strait of Evripos and the city of Chalkida. According to some scientists, the castle is located in the position of the ancient town of Kanithos. The fortress is a Turkish defence building (1684) which was used to protect the town by the Venetians. Inside the yard, the church of Prophet Helias since 1895 is located. The view from the hill is simply breath-taking. 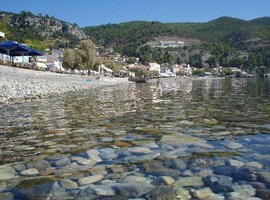 Aidipsos and its hot springs are perhaps the most important destination of the northern Evia. 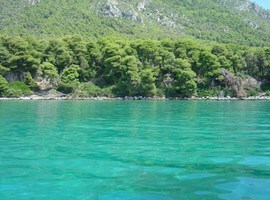 Aidipsos had been already famous worldwide in the ancient years for its hot springs and its therapeutic water. The modern years, Aidipsos is developed to the biggest tourist resort where the visitors come from the entire Greece and from places around the world to enjoy the curative baths. In the modern Aidipsos there are a lot of luxury hotels, hotel complexes and ultra-modern Spa. The hot and mineral waters of Aidipsos with their temperature of 47-49 degrees C, according to scientific studies, it’s the ideal combination for the resulting cure of diseases like rheumatism, arthritis, cervical vertebrae and many more. The town is composed of three settlements; the seaside resort-town of Aidipsos, the totally green village of Aidipsos and the coastal village of Agios Nikolaos with its beautiful beaches and its many taverns. In the area of Aidipsos, wonderful beaches are located which thanks to their geographic position are protected from the winds, offering a great experience of sunbathing. Remarkable are also the hospitality of the local residents, the tourist facilities and the rich cultural events. The tower of Aidipsos or Frangoula is a Venetian tower of the 14th century. It is preserved quite well in a high height and is about a Frankish tower which is considered as the home of Baroness Petronella Toko. It’s one of the most important archaeological sites of Evia. 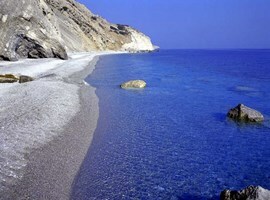 It is located near the beach of Aidipsos and its findings are many and magnificent. The findings belong to the most ancient Neolithic period (6.000BC) but also to next periods. This is simply an amazing museum! This sea museum is created with the purpose to offer to its visitors the natural beauty, the knowledge about the environment while the same time supports its protection. It hosts a projection hall, 3.000 exhibits from the entire world and an impressive tour about how these beautiful sea creatures gave to peoples ideas to make our life more functional and modern. The most of the beaches in the area are fully organized, so you don’t need to take something with you except your swimwear and your happy mood. The most popular of them are the beaches of Golden Sand (a meeting point for the youngers), Agios Nikolaos (with its super delicious cocktails), Bania Yaltron, Kavos Lihadas, Loutra of Aidipsos and of course the central beach of Aidipsos. The most of them have a golden, fine sand and shallow crystal blue waters. It’s a gracious and hospitable town, built amphitheatrically on a totally green full of vegetation lace, with a wonderful view to the Aegean Sea. The town’s beauty compose the stone-built mansions and the picturesque paved streets. Kymi is famous also for its dried figs (the town has an agricultural association) and traditional delicious sweets. However, the top place in Kymi is the Beach of Kymi, a picturesque holiday village and port with a great fishing activity. Taverns, coffee bars and pastry shops along the coastline collect the tourist crowds in town. The port connects Evia with the island of Skyros via ferries. 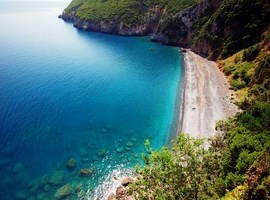 The best beaches for swimming in Kymi are the: Sutsini, Kalogeros, Beach of Kymi and Platana, the large Stomio and Mourteri, Tsilaro and Thapsa. The ascension of Kymi: it’s a race of the Greek Championship of racing cars. The cultural summer: concerts, dramas, dancing performances and art exhibitions. The Fig Festival: the festival is organized in the late days of August every year and presents everything related to the local treasure, the figs. Eretria is a port of Evia with a great tourist traffic and connects Evia with Attica (Skala Oropou). Monuments of antiquity, neoclassic buildings, squares, green areas, palms, eucalyptus, the picturesque Island of Dreams and the coastal pedestrian zone with its cafes and restaurants, make up the beautiful picture of Eretria. The beach of Eretria is popular and organized. You can enjoy a cool coffee or cocktail in the local beach bars. In front of the town of Eretria, just 90km away from Athens is the wonderful little island of Dreams or Pezonissi. It’s connected with the town with a 30m bridge. The island is a rich of vegetation place, with golden beaches and clear turquoise waters. The natural beauty of the landscape which is the biggest advantage of the small island relaxes and captivates both the young and elder people. All of the beaches of the island are awarded with the European Blue Flag thanks to the water purity. The open theatre of the island hosts numerous cultural events every night during the summer. Theatrical performances, concerts, film screenings, dance performances and art exhibitions are just a few of the cultural events that await you on the Island of Dreams. The museum hosts exhibits from the town of Eretria, its temples and cemeteries from the Neolithic period (6000BC) until the Roman years (1st century BC). The first temple – according to tradition- was an arched temple built during the Geometric period (8th century BC). In the early 6th century BC was built on this an Ionic temple, while in the late 6th-early 5th century BC was built a Doric temple which was destroyed by the Persians in 490 BC. The monument suffered a second major disaster in 198 BC and ruined in the 1st century BC. Karystos is a town built in the safety of a picturesque bay and embraced by the impressive mountain of Ochi. It’s a town full of sweet scented lemon trees, roses and other flowers. It has wonderful sandy beaches and beautiful villages. A place with tasty, fresh fish and the renowned delicious goat and lamb dishes served in which are located in the coast of Karystos. Karystos is also known for its unique urban planning designed by a Bavarian civil engineer who carried out the personal wish of the first king of modern Greece, Otto. Karystos has everything; wonderful country areas for the nature lovers and hikers, gorgeous beaches, archaelogical monuments for the history lovers while the same time you can find excellent food and desserts. All of the above, in less than two hours from the centre of Athens. 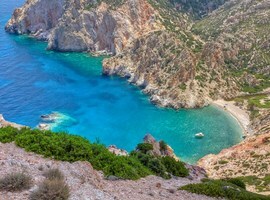 Karystos has over 60 beaches, however we will mention the most beautiful of them: Gallida, Kavontoro Arhampoli, Platanistos Potami, Kavontoro Kallianos, Bouros, Megali Ammos, and Kastri. It’s a coastal town with a remarkable culture heritance. In the modern port of Nea Artaki are hosted sailboats, yachts and fishing boats. The picturesque beaches with the café bars, taverns and ouzo attract numerous visitors. However, the most beautiful attraction of the town is the magnificent sunset. The best beaches of the place are Voleri and Kalamia. Do not miss the opportunity to taste fresh fish in the local taverns. 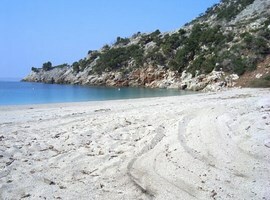 The beach of Almyropotamos: It is a beach full of café bars, taverns and has a lot of people during the summer months. The beach has sand as its sea bed. If you want to stay overnight there are hotels and rented rooms. If you continue the coastal road, you will come to another beach called Blue Lagoon because it looks exactly like that. It is a very small beach with a beach bar. Styra, Marmari, Agia Anna, Pefki, Limni and Drosia are also few of the beautiful towns of the big island of Evia. It’s a great place to visit as you can enjoy the beauty of an island combined with the comforts of the mainland. The fresh fish, the wonderful beaches and the famous Greek hospitality will excite you!